I personally have a love/hate relationship with biographies. I love that reading biographies with my students can encourage them to dream big, about what they might do with their lives. I saw this in my classroom in the inner city. Before starting my biographies unit with First graders I would always surgery the class to ask them what they wanted to be when they grew up. I always got the same 3 answers (yes only 3 it broke my heart), "I want to work at Dunkin Donuts", "I want to work at Walmart. ", or "I don't know". Now, don't get me wrong, There is absolutely nothing wrong in anyway with working in a fast food place, department store, or not having made up your mind when you are 6, it just seemed sad to me there was no one dreaming of a career that involved going to college, or even really, graduating high school. Then we would dive into our biographies unit, we would read about Dr. Seuss, Jacques Cousteau, Hank Aaron, Johnny Appleseed, Abraham Lincoln, and Albert Einstein among many others. We read the books, compared the historical figures, discussed text features, wrote letters to the famous people, and if they were still living, mailed them. We had a great time. When we were all done I surveyed my students once again and now along with wanting to work at Dunkin Donuts, and Walmart, I had students who wanted to be doctors, lawyers, politicians, authors, and inventors. Even those who said "I don't know" were now shifting to, "I can't make up my mind." It is amazing how biographies can help children realize that they have endless possibilities. That is what I love about them. I also love the projects. I tend to have students complete a lapbook, which we leave on desks for parent conferences. My son had to do a super cute poster project where he cut out his face and drew the body of his hero (Wayne Gretzky) then stood behind it to deliver his oral report. The 4th grade at the school I began teaching at always did an elaborate and amazing wax museum, as a fund raiser. There are so many ways to use projects to make biographies come alive for students. Now the bad part, biographies for children can often either be engaging but lacking much substance about the individual, or have loads of information, but be dry as toast. The other issue, is it is hard to have enough biographies in your classroom to go around, especially if you are new to teaching. I want to share my trouble shooting tips and tricks to help you have a great - big dream building - biographies unit this year. It's not too late I promise. First, gather together all the biographies you have access to (personal library, school library, local library, classroom library), group them by type (books about authors, books about scientists... etc....) and make a list. Are there any categories you do not have books for and wish you did? List those categories too. In advance of your unit, send home a letter to families letting them know about your upcoming unit, and asking if they have any biographies at home they could lend to the class. You never know, I have had some sent in before, and it never hurts to ask. Add any books you have borrowed to the list. The last place to look for biography information is online. This can be the trickiest, but it is an important resource. It is important in this day and age for students to be able to access technology for research, however most website are written for adults, not children, and can be extremely difficult to read. Web research can be extremely frustrating as a result. I find it is best if as a teacher I do the research in advance, and make a list of websites my students can actually use. For example biography.com has loads of information on many many people, but it can be difficult to read without an adult's help. On the other hand, ducksters.com Has excellent biographies for children, but there is a much smaller selection. It is important to make a list of which famous figures students can read about have web biographies they can actually read. Once you have your list made, I would have students choose their research topic, from your approved list. It is great if they have other ideas, but I promise you, for your sanity, and theirs make them choose from the list you just spent so much time creating. If it is not on the list you probably do not have enough information for them to complete their project without tears being in the mix. Another strategy you can utilize, is to have groups of children study the same individual. This works best when you have several books on the same individual, and each book has a bit of new information over the others. Martin Luther King Jr. comes to mind for this option. This set up is great for students who probably need a bit of extra help on the project. They can take turns with the different books, compare notes, and discuss them like you would a book club. The teacher can it with them, and monitor, and in the end they can either complete 1 project together, or each do their own project from their shared notes. Whatever you choose to do, remember to save your list to use again next year. 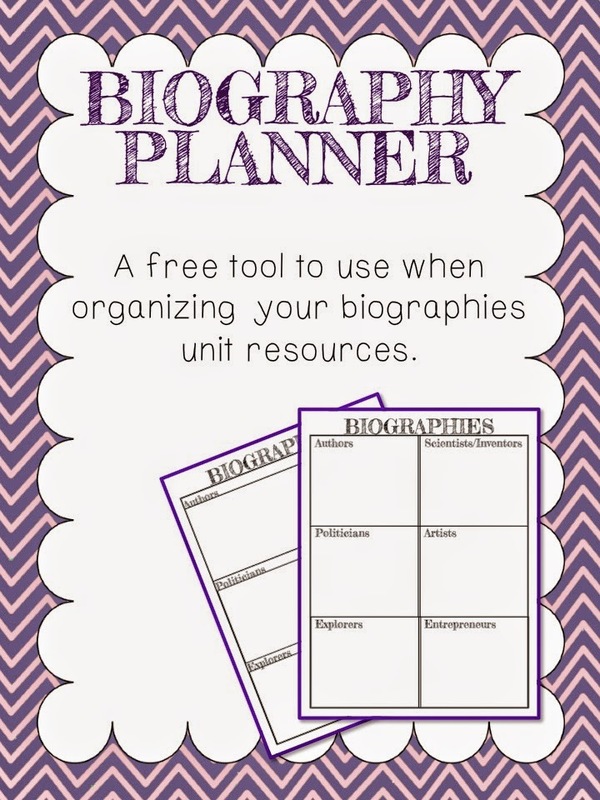 It will save you time and headache and help make your biographies unit a big dream success. If you would like a copy of my organization sheet, feel free to click the image below and download your freebie.